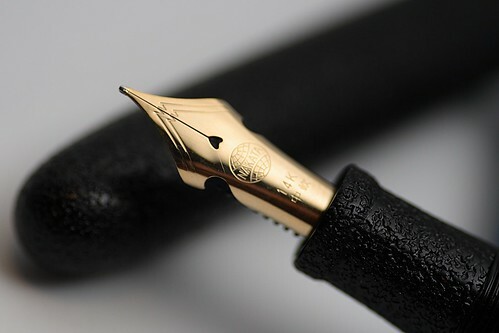 Nakaya is a fairly new Japanese fountain pen company, having been set up in 2001 by Toshiya Nakata, the grandson of the founder of Platinum pen company, one of Japan’s top fountain pen manufacturers. 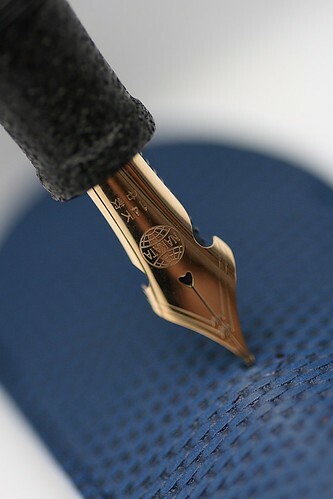 Nakaya has differentiated itself by specialising in customised fountain pens handmade by experienced craftsmen who formerly worked for the Platinum Pen company. It used to be that the only way to get hold of a Nakaya pen was to order it from the website or to walk into their showroom in Tokyo. In recent years they have started appointing overseas distributors who would stock these pens locally. My favourite pen specialist shop Pengallery started distributing Nakaya earlier this year. It is one thing to admire these pens on Nakaya’s website but once you get to test one of these with your own hands at the friendly neighbourhood pen shop I can guarantee that you will be reaching for your wallet in no time. That pretty much sums up my first encounter with this particular Nakaya pen. Now that I have had the pen for a few months I guess it is a good time to share my experience with a brief review of this wonderful piece of writing instrument. 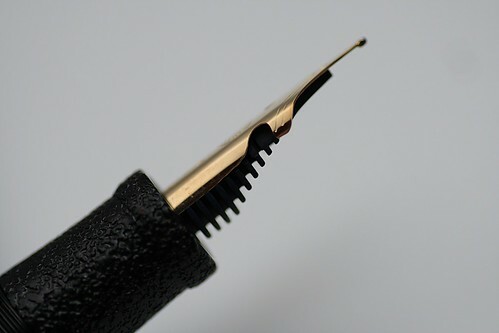 Like all Nakaya fountain pens, this pen is handcrafted and is finished with a variation of the Urushi technique whereby Urushi powder is sown onto the surface of the pen to simulate grainy stone surface. I had it fitted with one of Nakaya’s special flexible nib. First thing that you will notice about this pen is its weight. Being made from ebonite, the pen is very light and one will be able to write with it for a long time without experiencing fatigue. The stock is based on the standard cigar model (portable size), without a clip. 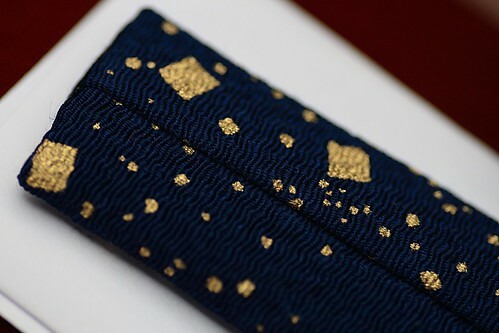 “The craftsman sows Urushi powder onto the body, which makes a lot of grains on the surface due to surface tensity. After settled, he varnishes the body with lacquer several times to make the body harden. He sharpens these grains with charcoal and finished with wipe lacquer. 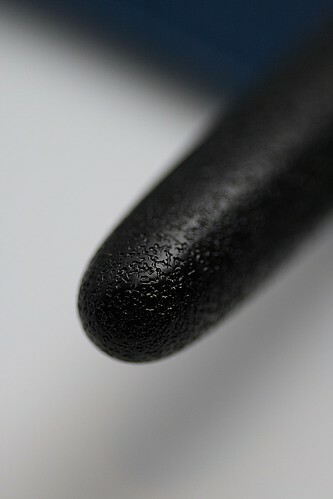 The Ishime finish is not one of Nakaya’s standard products. 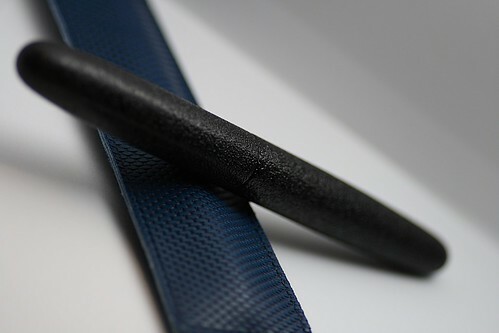 A special order has to be placed for this pen and lead time is normally quoted as 45 ~ 60 days. As I bought mine from Pengallery, who had pre-ordered it in anticipation of demand, I did not have to endure the long wait. 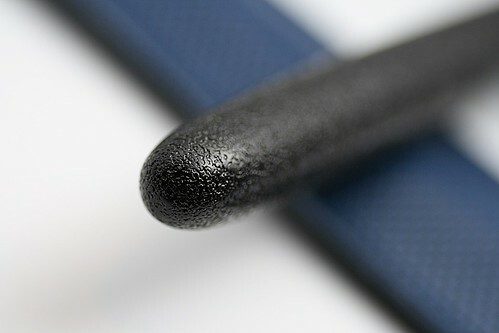 Aesthetically the Ishime technique bestows an elegant and unique look to the pen and the textured surface is pleasant to the touch and enhances the grip on the pen. I understand that one can custom order the Ishime finish with the other pen models such as the Piccolo or the Writer model. With hindsight I would have ordered this pen with a clip, ie a portable Writer model instead of a portable Cigar. Without the clip I tend to hesitate bringing this pen around for fear that it may just slip out of my pocket. Now I use it mainly as a desk pen. 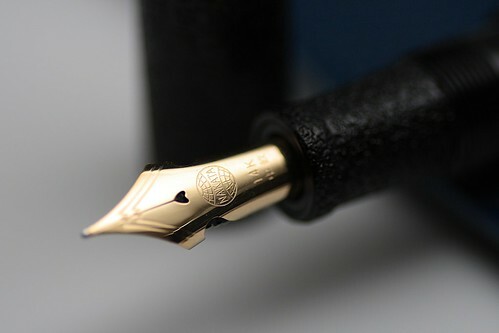 While I ordered the pen for its aesthetic features, it is the flexible nib fitted on it which I find really endearing. 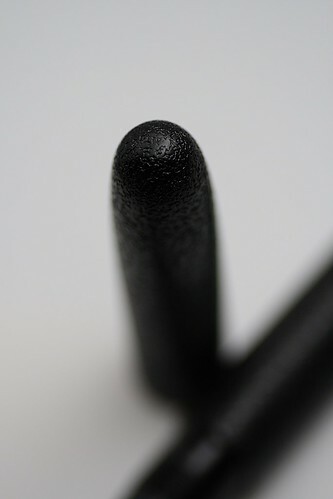 The nib has been crafted with special cut outs on the sides which allows it to flex according to the pressure applied by the user. As can be seen, the ink flows nicely without any skip. The sample above was written with ink from the Platinum cartridge which came with the pen. I have yet to use the Platinum converter with this pen. 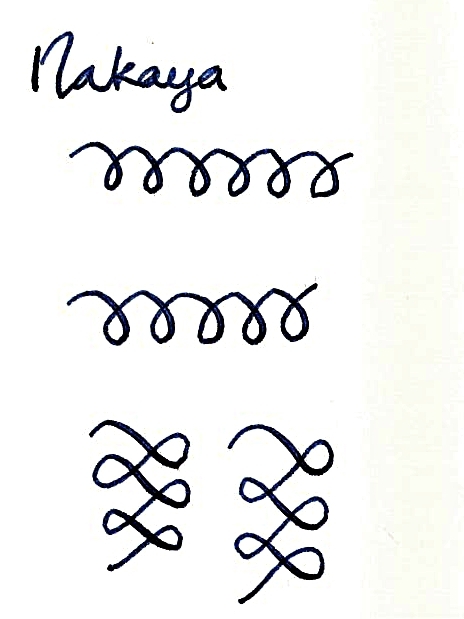 Prior to this pen I really did not have any experience with other flexible nibs but I did come across quite a few lamentations from the more experienced users about the lack of flexible nibs in modern pens. I did not realise what I had been missing until now. In fact I was so happy with the nib that I placed an order (through Pengallery again) for a Piccolo writer model (with reddish red tamenuri finish), equipped with Nakaya’s special flexible nib (two toned instead of monotone). This time I filled up the questionnaire which is required for Nakaya’s craftsmen to fine tune the pen and nib to my personal style of writing. I intend to post a review of the Piccolo writer as soon as I can find the spare time to take the photos and write about the experience. 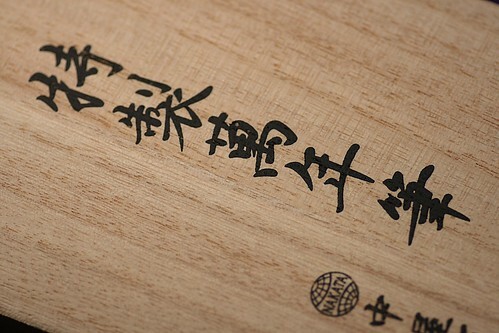 The pen comes packaged in a simple but elegant wooden box, decorated with Japanese characters which translates roughly as “custom made ten thousand year pen (fountain pen)”. Nakaya has also supplied a nice cloth pouch in which to wrap the pen. 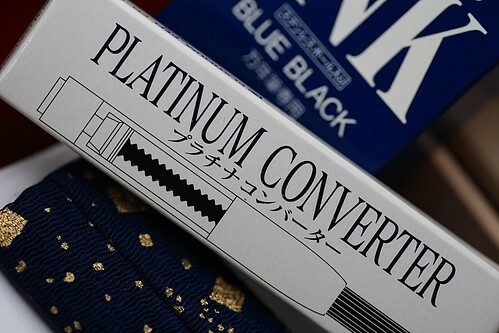 Nakaya’s strong link with Platinum is emphasized by the packaging of Platinum converter and ink cartridges with all their pens. To sum it all up: This is a great pen which I would not hesitate to recommend to any pen enthusiast. Wonderful post and pics, thanks! I am glad you find the review useful. Thank you for spreading the word on Pentrace, Fountain Pen Network and Network54, and also thanks for the link on your wonderful blog. I just wanted to know if this pen is available in a broad nib or extra broad nib and I need to know the price and how to order it. Great review, and the pictures are beautiful love the depth of field! roller pen is availabe or not. For used pens you can check out the sales section of Fountain Pen Network. Hi Danny, That’s a really well written and interesting article. I am glad that you found the article interesting. Nakaya offer fantastic hand crafted fountain pens but it can be difficult to find a retailer which have their products in stock. Ordering online directly from Nakaya is probably the best choice.